Judy Haiven reports on the health services strike in the UK. Judy is a member of Solidarity Halifax and teaches industrial relations at Saint Mary’s University, Halifax, NS. She never misses being on a picket line – even now that she’s on sabbatical in Chester, England. October 13 saw a walkout of tens of thousands of staff at NHS (National Health Service) facilities up and down the UK. In a strike that lasted four hours from 7 to 11 in the morning, cleaners, nurses, porters, paramedics, midwives, administrative officers and others struck most hospitals in the country. Chester, a city of 120,000 in England’s northwest, was no exception. 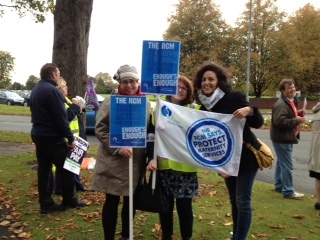 At the local hospital, the Countess of Chester Hospital, it was mainly midwives and midwives’ assistants who walked the picket line. For the first time in its 133 year history, the members of the midwives union, the RCM or Royal College of Midwives, walked out on strike. Midwives, who are responsible for care of pregnant women and deliver their babies at hospital and home births here in the UK, earn from £21,000 to £34,000 a year ($35to $57,000Canadian). I was on the picket line with Natalie, who had just qualified three weeks ago and is paid at the bottom of the scale. In fact, the central government’s offer was 1% only to those 40% of employees who have topped out their increment meaning for those already at the top of their wage scales. The offer for the other 60% (including almost all of the midwives) was zero. That’s right, zero. The unions had been asking for 3%, but the Health Secretary (Minister of Health) had publicly stated that the government could not afford to give the NHS workers more money, and that any increase would mean serious layoffs of staff. Before walking out, midwives along with other essential workers negotiated emergency cover—and several women on the picket line were on-call even that morning. The strike Monday was the start of what was to be a week of public service strikes. But the major unions including UNITE, UNISON and the GMB called it off. At first the unions mobilized around “a fair pay rise for Britain” especially for their members in local government, the civil service, school support services, job centres and more. But the central government made an offer of 2.2% over two years which has staved off a strike.